Comparing an unmanned aerial vehicle to a magnetic resonance imaging machine may seem odd, but that is how the director of the Mississippi State University Geosystems Research Institute sees it. "The plant is the patient, the agronomists are the doctors, and I am the guy who works on the MRI machine," said Robert Moorhead, GRI director and Billie J. Ball Professor of Electrical and Computer Engineering in the MSU Bagley College of Engineering. UAVs—flying above tractors but well below manned aircraft—are the newest instruments used in precision agriculture. 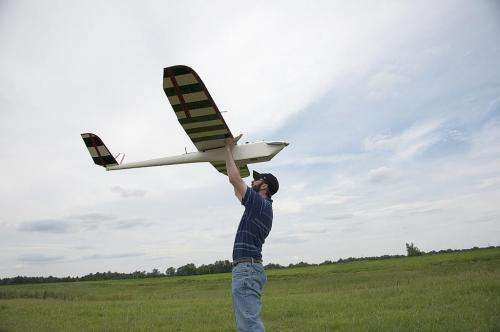 Mississippi State holds certificates of authorization from the Federal Aviation Administration to operate UAVs for research purposes, and Mississippi Agricultural and Forestry Experiment Station scientists have been using the remotely piloted aircraft in various studies. FAA officials are developing regulations for the commercial use of UAVs, and Congress has set a September 2015 deadline for the agency to establish rules specifically for small, unmanned aerial systems. So far, the aerial equipment has been approved for commercial use only in a very limited capacity. In the meantime, Moorhead and his GRI colleagues are working with MAFES agronomists and MSU Extension Service specialists to incorporate the use of UAVs in site-specific agricultural research. Moorhead said scientists are using the aerial equipment in research related to irrigation, plant growth, nutrient management and herbicide application. Precision agriculture requires a number of other technologies, including remote sensing, global positioning systems and geographic information systems, Moorhead explained. These technologies are designed to collect and analyze site-specific data that can be used to create and apply effective prescriptions for every inch of an agricultural field. Before the advent of unmanned aircraft, remote-sensing data had to be collected with satellites, ground instrumentation and piloted aircraft. "UAVs now are another remote-sensing tool available to collect visual and multispectral data," Moorhead said. "Precision agriculture is data driven, and UAV technology adds another significant layer of data for researchers and, ultimately, crop consultants and producers to assess and utilize in a meaningful way." In one recent study on corn plant growth, GRI personnel worked with Brien Henry, an associate professor in the MSU Department of Plant and Soil Sciences. Henry and his team planted several corn hybrids at various dates and plant densities. From March to May 2014, they planted 20,000 to 40,000 plants per acre in fields at Starkville, Brooksville and Verona. They used UAVs to collect plant population data, such as emergence progress, plant heights, growth stages, plants per acre and numbers of unfurled leaves. While Henry's study was in its second year, this was the first time UAV technology was used to augment research on the ground. "They were flying overhead and collecting visual and multispectral data," Henry said. "At the same time, the ground team was analyzing the data to ensure images from above was what we were actually seeing on the ground." Henry said a primary goal of his research is the development of automated computer programs that can recognize individual seedlings and quickly and accurately determine plant density across a planted field. Spatially explicit maps of plant populations would allow producers to make timely and informed decisions about replanting, he explained. UAVs are capable of flying as low as 100 feet above the ground, while small, manned aircraft must operate at elevations between 2,000 and 3,000 feet. Of course, satellites can only look down from space orbit. Clearly, a difference in altitude can impact resolutions dramatically. Henry said UAVs can zoom in to a resolution of approximately one-eighth of an inch, while planes and satellites are limited to collecting images at resolutions of about 18 inches. Also, UAV images may be collected during bad weather, and one UAV can cover approximately 1,000 acres in an hour. For researchers, the most critical UAV component is its payload system—the camera. Various payloads can collect both visual and multispectral images and real-time, high-definition video. Data from a UAV payload can be immediately downloaded to a tablet or smartphone, which allows researchers to quickly and efficiently evaluate information. "UAV technology provides additional eyes on the field," Henry said. "I hope that someday the technology helps producers assess and address potential stand issues quickly and accurately." Wes Burger, MAFES associate director, said precision agriculture currently encompasses a vast wealth of data-driven applications. "These applications are built on sound research that characterizes relationships between observable phenomena and plant performance," Burger said. "Precision-agriculture research is about connecting data to decisions. The meaningful data within those applications helps drive every decision the farmer makes in the field." Burger said the goal of UAV research is to collect data that will augment and improve current management practices so farmers can boost yield, productivity and profit while enhancing environmental stewardship.